The sword is a powerful symbol in many cultures, including that of China. Straight swords (chien/jian) are used extensively by Taoist priests in Religious Taoist liturgies (public worship laid down by a church or religion) for protection and exorcism, as powerful bearers of ‘yang’ energy (creative, brightness, male). The sword in Mahayana Buddhism represents the Sword of Wisdom, which cuts through ignorance and delusion. In iconography, swords are frequently seen in the hands of Taoist Immortals and Gods, especially those important for exorcism such as Lu Dong Bin, and Zhong Gui and of course Guan Yu, the God of War and Literature. In Buddhist iconography, swords are carried by Bodhisattva of Wisdom Manjushri, and by temple guardians. 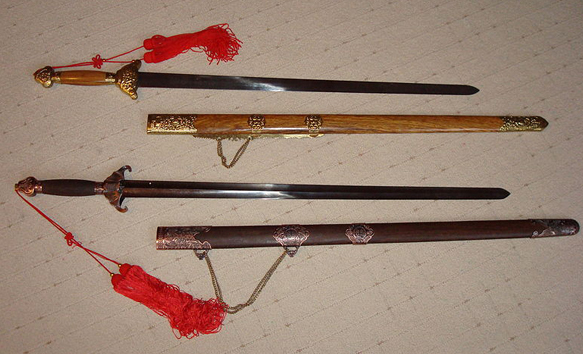 As military weapons, swords have been used in China for at least 3,000 years. Not surprisingly, the many systems and forms of T’ai chi ch’uan have forms using the jian (chien) or straightsword. Many regard these as the most advanced form of training. This weapon was traditionally custom made for the specific user, but normally has a three-foot long blade and a long hilt. It has a sharp point and fine cutting edges on each side of the blade, below the tip, but only for about six to eight inches. Below that, the blade is blunted for parrying, and to give greater strength. A simple cross hand guard is normally fitted. The design of the jian indicates its use as a precision weapon designed to penetrate specific points, such as pressure points on the body or gaps in armour. It is never a weapon for slashing or bludgeoning, using brute force. Incoming thrusts are evaded or parried – not blocked as such. The sharpened edges near the tip are for precision cuts to arteries or the windpipe. It can be seen that the sword is meant to be used in accordance with the T’ai chi principles of softness, avoidance of force, and exploiting the weaknesses and imbalance of an attacker. Opinions vary about the use of lightweight, blunted or wooden swords. Some teachers prefer students to learn the form with these, as learners can keep the sword under precise control without using strength. Others insist that the form is an advanced weapon and should only be trained by proficient students who can bear the weight of a real sword, and use that weight, without falling into the trap of using strength to force the sword. The sword forms of the different schools are always in accord with the principles and dynamic of their specific form. Partner work and reflex sensitivity drills are an essential part of advanced sword training. Another type of Chinese sword is the Dao, or broadsword. This is clearly a military-based, slashing weapon, but there are T’ai chi schools that teach it as a preparation for the more advanced Jian sword, and as a useful form of resistance and agility training. This is because the Dao is the traditional heavy weapon of the footsoldier, and can therefore be swung with vigour to loosen up the joints and stretch the ligaments. It should be added that training with swords, even lightweight weapons, can be dangerous and should only be undertaken with instruction from an advanced teacher who is qualified to do so.